December 1950: A killer blizzard is smothering the Midwest. America is staggering into the Korean War and a Tennessee Senator has the nation riveted by his anticipated televised grilling of mob kingpins—a public spectacle and galling embarrassment to FBI director J. Edgar Hoover who has steadfastly denied the existence of the Mafia. In a snowbound hotel bar, crime novelist Hector Lassiter is reunited with old friend Jimmy Hanrahan, an Irish cop committed to catching the one criminal who got away. Jimmy's in pursuit of America's most macabre serial killer—the so-called "Torso Slayer" or "Cleveland Headhunter"—a prankish psychotic who has long eluded capture by Jimmy and famed "Untouchable" Eliot Ness. Hector and Jimmy's reunion is interrupted when a young girl tugs on Hector's sleeve and says, "Please, mister—my mommy needs help." The little girl drags Hector and Jimmy from the bar into a deadly crossfire and cross-country chase—pursued by mobsters, corrupt cops, disgruntled federal officials, a fearsome bounty hunter and an army of rogue private investigators. 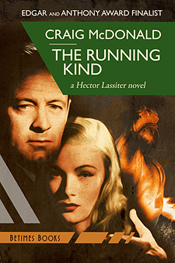 Hector, the maverick, ever "the running kind," is also confronted with the woman who may be his salvation—the one who offers a prospect of the settled life that has so long eluded Hector, if he can survive through to the New Year. Along the snowbound back roads of lost America, Hector and Jimmy face devastating betrayals, duplicitous women and the prospect of near-certain death in the deserts of Mexico. Hector and Jimmy find themselves locked into a history-changing death race that tests their friendship and brings them in contact with a cast of 20th-Century notables including crooner/mob schmoozer Frank Sinatra and his sultry, soon-to-be wife, Ava Gardner. The Running Kind expertly blends fact and fiction for a darkly humorous, hard-boiled rollick that evokes the feel and pace of Craig McDonald's highly acclaimed, Edgar®/Anthony-nominated debut novel (and forthcoming graphic novel) Head Games.